Chinese mystery snails in Atlantic Canada. Are Chinese mystery snails a concern for the eastern Canada region? Our reporting app is now launched! We are currently doing beta testing so your feedback would be appreciated. If you think you may have found Chinese mystery snails anywhere in the Maritimes or/and Newfoundland & Labrador, please test our iPhone / Android app! Your feedback is important. Instructions (PDF) or try this link to next page with graphics. If you can't use the phone app, please take a photograph and send us an email at mystery.snail.reports@gmail.com! We will follow up and once verified, add your report to our interactive map. Many lakes and rivers in Nova Scotia, New Brunswick, Prince Edward Island and Newfoundland have been found to have Chinese mystery snails. To date, most work on aquatic invasive species only focused on sport fish species. However invasive aquatic invertebrates such as the Chinese mystery snails are also of concern. The Chinese mystery snails are an aquarium & food species native to east Asia which may be spreading through the Shubenacadie waterway system in Nova Scotia and the Saint John System in New Brunswick. Reports also have been made from Newfoundland and Prince Edward Island. 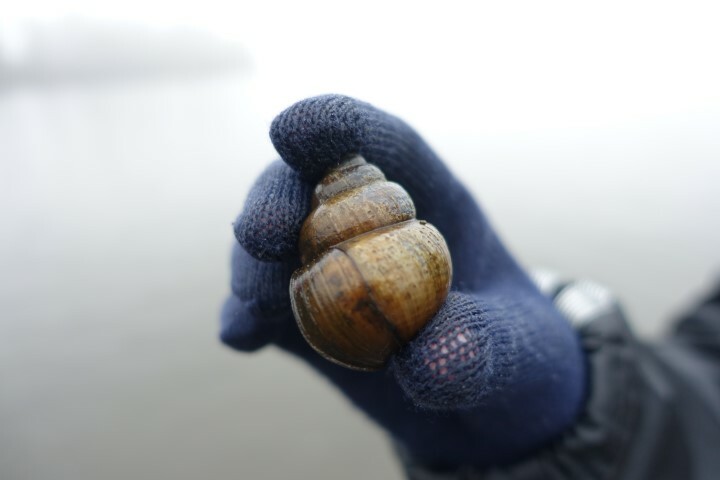 Chinese mystery snails, Cipangopaludina chinesis (synonyms: Bellamya chinensis, Paludina chinensis), are more recently discovered in Nova Scotia lakes and New Brunswick river systems at high numbers. Those are thought to be probable aquarium species released inappropriately into lakes. Those snails have been reported widely across the USA but are not as well studied in Canada. This snail species orginates from the far east of Asia & Russia regions. Chinese mystery snails are a very hardy species which can tolerate a wide range of temperatures in freshwater ecosystems. Those snails have a "trapdoor" (operculum) covering their shell opening providing significant protection. Chinese mystery snails have gills for underwater respiration and can survive extended periods in air. In addition, those snails are live-bearing (does not lay eggs), with female snails having the capacity to contain over 100 fertilized embryos for eventual development and release as juvenile snails. There is concern that the Chinese mystery snails may be distrupting native mussel and snail populations, impacting fish feeding patterns and even shifting nutrient cycling in lakes which could encourage algal blooms. 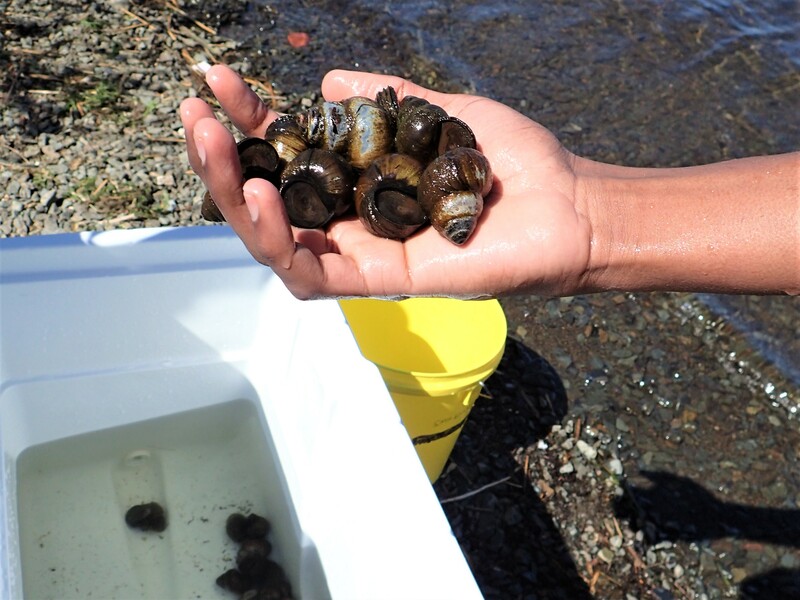 We are collaborating with Department of Fisheries & Oceans, the New Brunswick Museum, Maritime Aboriginal Aquatic Resources Secretariate (MAARS), and other groups & colleagues to map out the distribution and impact of the Chinese mystery snails. Where are the Chinese mystery snails? We are developing an interactive web map program with a phone app to be used to faciliate easy reports of potential Chinese mystery snail reports and will be launching this in Spring 2019. This will be a part of a citizen science & collaborative framework to support our mapping efforts. In the meantime, please use our email address, mystery.snail.reports@gmail.com, to send us reports and questions. This will be in parallel with habitat and migration studies in selected lakes in Nova Scotia to assess the ecology and biology of the Chinese mystery snails. We are also developing a predictive model to assess where Chinese mystery snails could be found, and will be using our interactive map to assess and verify the model. What are the impacts and ecology of the Chinese mystery snails? Once we better understand the distribution of Chinese mystery snails, we will be able to undertake investigations of Chinese mystery snail impacts on our freshwater ecosystems. As the Chinese mystery snails are lower-trophic species in ecosystems which have not evolved to incorporate those large snails in their food webs, we anticipate indirect and unexpected impacts. In other studies in the USA, Chinese mystery snails, in conjuction with other invasive species, have been implicated in algal blooms, reduction of native mollusk species and changing fish food web dynamics. We are continuing this research in 2019-2020. If you are interested in potential applications of our research, joining our research group or would like to contribute to our data analyses, please email Dr. Linda Campbell. Alien species in Nova Scotia. NS Government public communication document. Link. NS Lake bythometry maps & water chemistry data. Link. USGS Map of Chinese mystery snails across the USA. Link. DF McAlpine et al. 2016. Occurrence of the Chinese mystery snail, Cipangopaludina chinesis (Gray, 1834) (Mollusca: Viviparidae) in the Saint John River system, New Brunswick with review of status in Atlantic Canada. BioInvasions Records 5(3):149-154. PDF Document. Sarah Kingsbury's Chinese mystery snail MSc research website. Link. JB Burch. 1989. North American Freshwater Snails: Introduction, Systematics, Nomenclature, Identification, Morphology, Habitats & Distribution. Walkerana 2(6):1-80. Freshwater Mollusk Biology & Conservation Link. PDF download. DS Davis. 1985. Synopsis and distribution tables of land and freshwater mollusca of Nova Scotia. Nova Scotia Museum Curatorial Report No. 54. 33pp. PDF Link. KE Perez & G Sandland. Key to Wisconsin Freshwater Snails. Link. (with photos). In particular, check this link to Chinese mystery snails to see how juvenile CMS compares with small native snails. SM Martin. 1999. Freshwater snails (Mollusca: Gastropoda) of Maine. Northeastern Naturalist 6(1):39-88. PDF Link. - Chinese mystery snails in eastern Canada. - Reporting Chinese mystery snails. All images and content copyright (c) Linda Campbell and other members of Dynamic Environment & Ecosystem Health Research Group.